A crisp new piece of paper in the old typewriter and away I go. Well, you know what i mean. My virtual typewriter - the laptop. Let me get something clear. In Second Life, I am me. I don't pretend to be anyone only me. I do what I do in real life - I try to be part of a left unity project. The Left Unity Project in Second Life is "Second Life Left Unity", and I am a founding member - again, for it's history, visit it's blog/ do google searches etc. My reason for this blog is that I want to write about my Second Life experiences that may not be covered in a political article on www.slleftunity.com. I want to write about experiences of people - who I meet - what they are like - why they are there etc. I also want to write about things i see/ enjoy in SL. I won't use anyone's SL or RL name without asking them when i write here. I have used SL for over three years now, so know my way around it pretty well, but the nature of the interface and medium is that it throws up surprises all the time. I meet new people and see new things in this medium all the time. Some of the art that people create in SL is absolutely amazing- especially the architecture and most definitely the avatars some people create. There is a myth about SL I want to put to bed straight away... that all avatars are twenty-something, tall, stunning etc. This is not true - though there are certain "sims" you could go where this is definitely the case. I will talk more about Av's another time. I just want to explain Plot. In RL, I am a 43 year old man. When I first went in to SL, I did my best to make Plot reasonably like me (well - with the exception of his hairstyle - he had a punk style, when at the time I had just shaved off my shoulder length mess of a hairstyle). I am not great at AV design, and a friend of mine redesigned Plot for me. She also found the robotic implants when I told her I wanted Plot to be a cyborg as I thought, I wanted him to be "imperfect." Recently I took 8 months out of SL, and at the weekend, with the help of another friend, I brought Plot up to date with a new AV, with the same cyborg implants. He definitely looks younger than 43, so I will try to silver his hair (though admittedly my own hair is not silver - but has speckling of silver...). Anyway, eight months out of SL has been interesting because returning to the "place" has been much like going back to a place I once lived. You find some people doing different things; new alliances; some people disappeared; some people with a different reaction to me and some people much the same. I am thankful for the latter for a number of reasons, one being the familiarity and two being that those I know, were continuing with building a left in the virtual world - which is something that is important, as Second Life is used around the real world by millions of people. 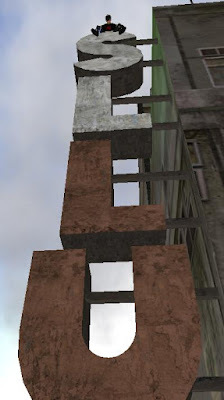 In Second Life Left Unity, we meet people from nearly every continent on the world, and hear stories of struggles in their real lives.